The Funky Felter: I've been Storqued! 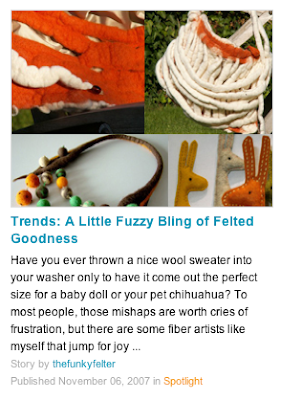 Etsy's blog features my article on felt trends and felting! I've been Storqued! 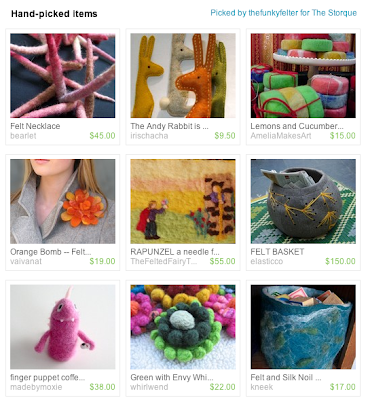 Etsy's blog features my article on felt trends and felting! I'm super excited about Etsy's blog, The Storque, featuring an article that I wrote about felt trends and felting! I worked with Vanessa, a terrific Etsy admin, to compose this article about all things felt. I often times forget that many, many people don't know any more about felt than what they see in the acrylic felt sheets in local hobby and craft supply stores (which isn't true wool felt anyway!). Felting is really an art form unto itself. It is most certainly a learned skill that lends itself to creating wonderful fiber art and wearable items. Anyway, before I wax on about my love of felting, you can read more about felt trends and felting in my Storque article. Now I'm off to dream of fuzzy felted goodies . . .